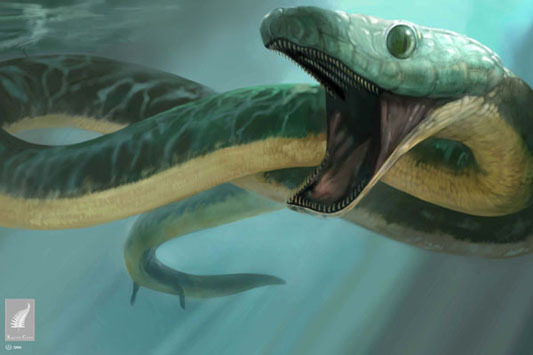 Were the ancestors of snakes aquatic or terrestrial? 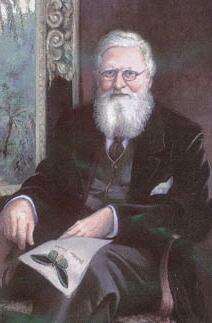 There are two competing hypotheses for the origin of snakes. The older, more accepted version is that snakes are descended from a group of marine varanoid lizards called mosasaurs. The more recent hypothesis is that snakes are descended from some other terrestrial lizard. The fossil snake Pachyrhachis problematicus was found in Cenomanian sediments at Ein Yabrub, Israel, and dates to about 98 million years ago. Two specimens are known. Pachyrhachis has well developed hind legs. The skull of Pachyrhachis has recently been CAT scanned, and study of the images suggests it is a basal snake, not closely related to any later clade. The CAT scans of the skull of Pachyrhachis are available online at the University of Texas Digimorph website. A more recent find is Najash rionegrina, from the Late Cretaceous of Brazil, dated to about 90 mya. 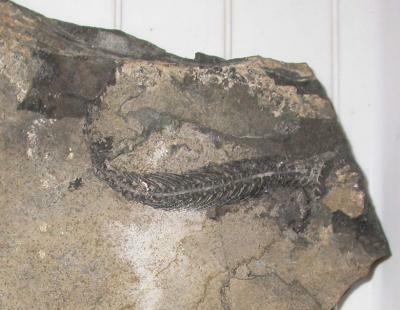 The sediments in which this fossil were found are terrestrial, suggesting that the earliest snakes may have lived on land, and therefore likely are not related to the marine mosasaurs, but presumably to some other group of varanoid lizards. Science Daily — It wouldn't have been the easiest way to get around. A University of Alberta paleontologist has helped discover the existence of a 95 million-year-old snakelike marine animal, a finding that provides not only the earliest example of limbloss in lizards but the first example of limbloss in an aquatic lizard. A University of Alberta paleontologist has helped discover the existence of a 95 million-year-old snakelike marine animal, a finding that provides not only the earliest example of limbloss in lizards but the first example of limbloss in an aquatic lizard. "This was unsuspected," said Dr. Michael Caldwell, from the U of A's Faculty of Science. "It adds to the picture we have of what was happening 100 million years ago. We now know that losing limbs isn't a new thing and that lizards were doing it much earlier than we originally thought. On top of that, this lizard is aquatic. All the examples we have in our modern world are terrestrial, so it's a big deal." The evidence offers the earliest record of vestigial limbs--once used in an animal's evolutionary past but that has lost its original function-- in a fossil lizard. The newly named species--Adriosaurus microbrachis--is described in the current issue of the Journal of Vertebrate Paleontology and offers clues to the evolution of terrestrial lizards as they returned to water. The fossil was originally collected during the 19th Century from a limestone quarry in Slovenia. It then sat at the Natural History Museum in Trieste, Italy for almost 100 years before Caldwell and a colleague found it in 1996 during a trip to Europe. He later connected with Alessandro Palci, then a graduate student in Italy whom he helped supervise, and they worked on the fossil together. 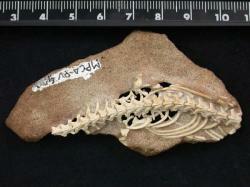 The researchers soon realized the lizard's front limbs were not formed during development. "There was a moment when I said, 'I think we stumbled on a new fossil illustrating some portion of the aquatic process of losing limbs,'" said Caldwell. "There are lots of living lizards that love to lose their forelimbs and then their rearlimbs, but we didn't know it was being done 100 million years ago and we didn't know that it was happening among groups of marine lizards." The researchers think this snake-like lizard was about 10 to 12 inches long, had a small head perched on an elongated neck, body and tail and relatively large and well-developed rear limbs. All bones of the forearm, including the hands and digits were not formed during development. "For some oddball reason the forelimbs were lost before the rear limbs when you would think it would be the opposite," said Caldwell. "The front limbs would be useful for holding onto dinner or digging a hole but it must be developmentally easier to get rid of the forelimbs." The most well known ancient fossil snakes also kept their hind limbs. Living lizards also show almost every variation in limb reduction from a perfectly formed back limb with no forelimb, or a spike for a forelimb and one or two toes on the rearlimb, to total limblessness. This degree of variation makes it very difficult to understand the pattern of evolutionary limb loss in these animals. "This discovery is one more data point that might help us answer some questions and perhaps shed some light on the fin to limb transition, which is a key step in the evolution of land animals," said Caldwell. "It doesn't give us all the answers but it's a start."